The fall of German Christianity leaves an emptiness that seems likely to be filled by a more multicultural and Islamic society. Germany today houses Europe’s largest Muslim community.Christians in Germany, Die Welt reports, will become a minority in 20 years. “Falling fertility has coincided so closely with massive secularization that we must at least ask whether the two phenomena are related, even if not in a neat one-to-one relationship”, the scholar Philip Jenkins also said. The Ratzinger-Schülerkreis is the circle made up of 41 former alumni of Pope Benedict XVI (born Joseph Ratzinger), who meet once a year with their former professor to discuss a specific topic. This year Pope Benedict has chosen the “spiritual crisis of Europe.” The guest of honor was the American jurist Joseph Weiler, who coined the expression “Christophobia” and defended the crucifix in Italian schools at the EU’s highest tribunal. As Pope, Benedict understood the cultural and religious crisis of Europe, and the former German professor sees his native country as a litmus test for the future of Europe’s Christianity. In Germany, where President Joachim Gauck was a Protestant pastor and Chancellor Angela Merkel is the daughter of a clergyman, in the country of liberal theologians — such as Hans Küng, Uta Ranke-Heinemann and Eugen Drewermann, who have fueled intense criticism of the Vatican hierarchy regarding ecclesiastical celibacy, birth control, the role of women, and sacraments for the divorced — Christianity is rattling. 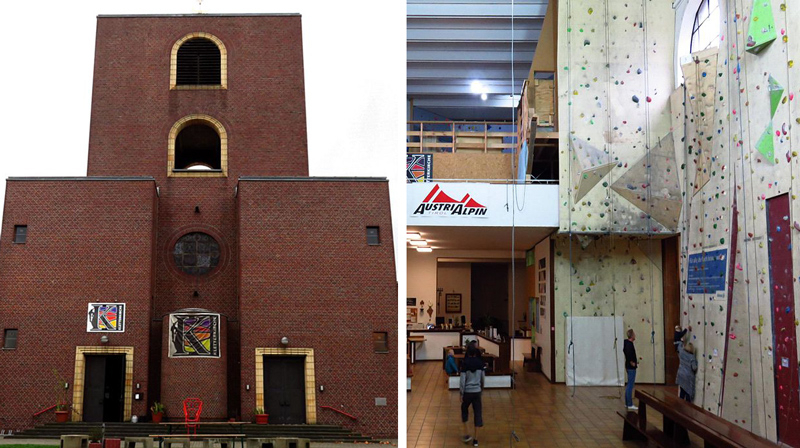 What was once the Catholic St. Peter’s Church in Mönchengladbach, Germany, is now an indoor rock-climbing facility — one of several known as a “climbing church” (Kletterkirche). Image source: Wikimedia Commons. This tendency is becoming the norm in Germany. Andreas Püttmann, a researcher at the Konrad Adenauer Foundation, called it “Gesellschaft ohne Gott” (“society without God“) in his book by the same title. “The long-term trend shows an epochal implosion,” Püttmann writes in the book. The fall of German Christianity leaves an emptiness that seems likely to be filled by a more multicultural and Islamic society. That is why Germany’s finance minister, Wolfgang Schäuble, just called for the creation of a “German Islam.” Merkel’s powerful ally linked the rise of a German Islam with the national demographic disaster. “Demographic change is one of our great challenges,” said Schäuble. Germany today houses Europe’s largest Muslim community. The latest annual report of the Expert Council of German Foundations on Integration and Migration explains that, due to the decline in the number of Christians in a period of mass immigration from Islamic countries, “Germany has become demographically a multi-religious country.” Christians in Germany, Die Welt reports, will become a minority in 20 years. Religious decline is usually followed by a demographic one. The London-based think tank, the Institute of Economic Affairs, just shed light on the “Europe’s demographic timebomb.” In the report, “From empty pews to empty cradles,” three American scholars, Eli Berman, Laurence Iannaccone, Giuseppe Ragusa, explain that in many European countries, the sudden drop in religious practice has determined a demographic suicide. Germany’s decline today is, in fact, also a military one. The German military (Bundeswehr) during the Cold War was the first line of defense against a Soviet invasion; now the army is decaying. The German army just spent 428 million euros on various operations relating to migrants during the past year. It has been the costliest mission within German borders that the army of the Federal Republic of Germany has ever undertaken. In the decades after World War II, the Germans have turned into hard-core pacifists, enjoying their role on the sidelines of global conflicts. The Bundeswehr was then turned into a humanitarian organization. To quote journalist and author Henryk Broder, “pacifism has become a German lifestyle” — not only for Germany’s leadership but for the society as well. Already today, one in 20 Germans — 5% of the population — is over 80 years old. By 2050, it will be one in six. Europe’s largest and richest nation is becoming a country for old men. A quarter of German men said “no” to children. It is such a terrible irony that Nazi Germany, which devastated the continent in its search of Lebensraum (“living space”), is now a nation for decrepit, disarmed and secularized men. And soon, Islamized as well.